Taking place in April each year in Augusta, Georgia, The Masters is the highlight of the annual golf calendar. In 2019, the tournament’s final round promises a memorable finish, after round 3 left European Ryder Cup hero Francesco Molinari two shots ahead of Tiger Woods heading into today’s final round, which sees earlier tee-times due to a weather warning. Here’s how to watch the Masters 2019 golf on TV or on online today, including free Masters live stream details and a guide to all the key times and Masters TV coverage in the UK. A quick glance at the leaderboard heading into day 4 of The Masters 2019 in Augusta, Georgia reveals that this year’s fight for the coveted Green Jacket is likely to go down to the wire. Italy’s Francesco Molinari is the leader heading into the final round on -13, just two shots ahead of a resurgent Tiger Woods on -11 alongside Tony Finau, who produced a stunning third round display to leave himself in contention. Ready to watch? Here’s how to live stream the 2019 Masters golf for free – and full UK TV coverage details. In the UK, live rights to The Masters 2019 TV coverage is owned by Sky Sports, which is offering comprehensive coverage of the final two days of the tournament on its Sky Sports Golf and Sky Sports Main Event channels. 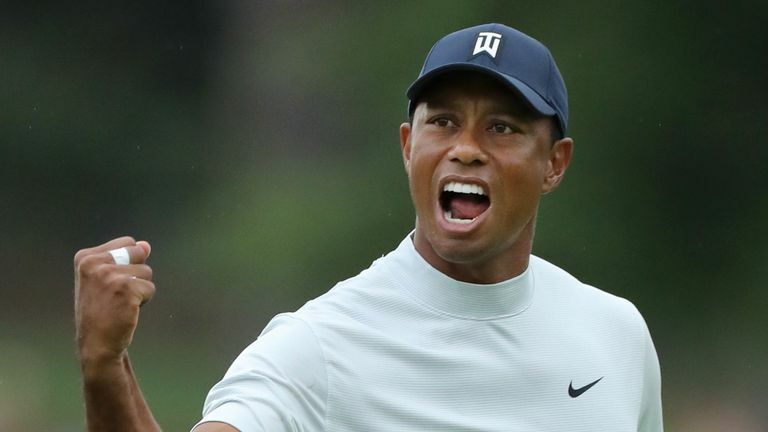 That’s good news for existing Sky Sports subscribers, as it means you can live stream The Masters 2019 for free using either the Sky Go or Sky Sports Mobile app, which are available on virtually every platform including Android, iOS, PC/desktop, and much more. The first tee-times for day 4 of The Masters 2019 have been moved forward to 12.30pm BST, with the leaders expected to tee-off at around 2.40pm. This is because of expected bad weather later in the day at Augusta, and also sees a break from tradition in that players will play in three-balls, rather than pairs. Those without a Sky Sports subscription but wanting to access its coverage of The Masters can make use of one of the provider’s excellent value NOW TV passes. A week pass will set you back £15.99, or follow the final day as it happens tomorrow with a £8.99 day pass. However, the cord-cutting off-shoot of Sky is offering a 9-month deal for just £195, which works out at just £5 a week and will also net you Sky Sports’ full coverage of The Open tournament his summer, plus every F1 2019 race, the Premier League title chase, and much more. You can bag a Sky Sports NOW TV pass on the cheap here. The BBC is also offering round 4 Masters TV coverage starting at 1.55pm BST on Sunday, April 15, and that means anyone with a valid UK TV license can live stream The Masters 2019 for free via its iPlayer streaming service. Details of how to watch The Masters for free via the BBC can be found here. As per the Sky Sports website , here are all the key updated times to watch or live stream round 4 of The Masters 2019 as it happens today. All times are BST. Enjoy this year’s ultimate golf event and best of luck if you’re hitting the course yourself – we know we always need it! Who are you tipping to win The Masters this year? Let us know on social media @TrustedReviews.